as I previously replied, I cannot change the name of the app without breaking every single user. And I don’t wish to do that. Perhaps if enough people contacted Netatmo they might be willing to change their policy but they won’t just for me. I did sent an email just now, hope it helps. Wouldn't it be possible to a copy of the app with a name that is allowed so new users can use the second app and older ones stick with the first app? Previously it was not possible to change a Netatmo APP name. However, that seems to have changed. Has been working fin up until now. Any ideas? It means the request sent to the server encountered an error. Probably on their end. 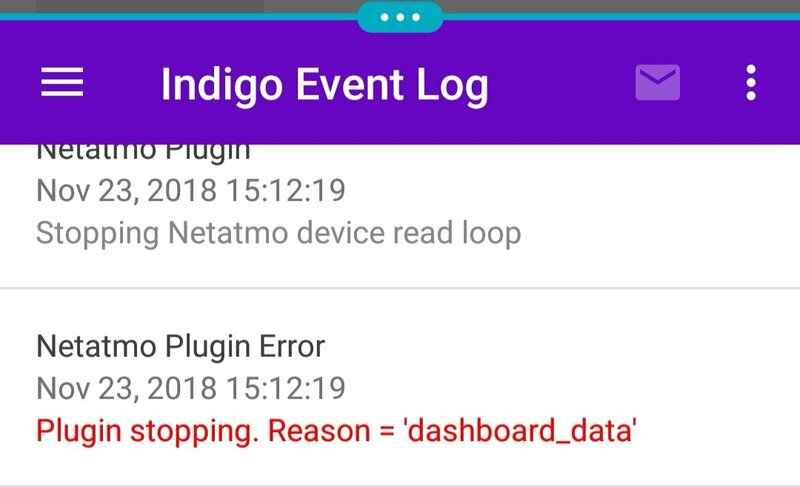 I'd restart the plugin and then check all your Indigo Netatmo devices. The netatmo plugin stopped working for me few days ago. The error I'm getting is: "Plugin stopping. Reason = 'NoneType' object has no attribute 'items'". It turns out that the API call inside "lastData" function returns station ID instead of the name. Providing the name will make the function return "None". The newest python netatmo library handles this correctly (but it also renames a lot of classes). For an immediate fix, I removed the "station" function parameter. It works for me because I only have a single station. I'm also getting the dashboard data error since yesterday. I haven't changed anything. Reloading plugin "Netatmo Plugin 0.6.4"
Stopped plugin "Netatmo Plugin 0.6.4"
Netatmo Plugin Log level preferences are set to "Normal". Started plugin "Netatmo Plugin 0.6.4"
Netatmo Plugin Your plugin version, 0.6.4, is current. Same result here. Just stopped working. Do you have time to look at the dashboard error we currently have? I have some sensors depending on the outside weather temp reported by the netatmo plugin.. So its a bit sad I had to disable plugin by now.. There was a change in the API at the same time the problems with the plugin started. (See: this post in the Netatmo forums ). That has now supposedly been addressed, but the plugin issue continues. Unfortunately, I am not at the location where my Netatmo and Indigo are installed and I have to dow any testing and make any changes remotely, which is difficult. I hope to get to this soon, probably before the end of next week. Of course, anyone else is more than welcome to take a crack at it as well. I have a fixed version of the Netatmo plugin available for testing. This is v 0.7.0 and addresses changes Netatmo has made, and will make starting 1/12. Please report any issues to this forum. If there are no issues observed, I will update the version in the plugin store. thank you, i had to disable my plugin as well due to the errors. basic question, the dropbox files are individual files/folders and are not in a single plugin file. what's the procedure for using this or making the plugin file? Click on the link, then in the upper right corner click on "direct download"; a ZIP file will be downloaded. ...basic question, the dropbox files are individual files/folders and are not in a single plugin file. what's the procedure for using this or making the plugin file? Sorry. It was late and I just dragged the plugin to Dropbox. A plugin is really a folder with special bits set that make it look like an app. When you download it as you did, those settings get lost. @MarcoGT's suggestion was good and will address the issue.